The East Asia Korea-Japan internship program is a non-paid internship organized by the Korean NGO Asia Hope Camp Organization, and by the Japanese NGO Acopia Friendship International. Are you looking for a working experience in Asia? To travel in Korean or in Japan? To learn a new language or discover East Asian culture? Perhaps all three at once? If your answer is "Yes!" to any of these questions, our East Asia Korea-Japan internship program is exactly what you need. Our internship is a 3 to 6 months internship open all year-round. This means interns can apply whenever and choose their working period as they wish. 3 months : 1 month in Korea and 2 months in Japan or the opposite, according to intern's preference. 4 months : 2 months in Korea and 2 months in Japan. 5 months : 2 months in Korea and 3 months in Japan or the opposite, according to intern's preference. 6 months : 3 months in Korea and 3 months in Japan. The internship takes place in Hongdae, Seoul, South Korea, and in Kumamoto, Japan. This internship is an unpaid one. At ACOPIA, we value experience and emotions more than anything. Our mission is to promote social activities and to facilitate free exchange of ideas. As interns will work as intrapreneurs under minimal supervision, they have to be autonomous and rigorous. During this internship, interns will improve their decision-making skills and project management skills, use and take advantage of their creativity, improve their interpersonal communication skills, and most of all, work in a fun and friendly environment. Interns will work from Monday to Friday, 10am to 6pm. Promoting friendship exchanges between citizens of Kumamoto and people worldwide, and contributing to the city's internationalization while working with the Kumamoto City International Center. During their internships, interns are required to stay in ACOPIA Houses (for girls only). Full rent must be paid prior to arrival for both accommodation in Korea and in Japan. ※ Water, electricity and gas, wifi included. - Kitchen, Refrigerator, Microwave, Water Purifier, Rice Cooker, Toaster, etc. The office and the housing part of Nagomi House are both located in the same residence. 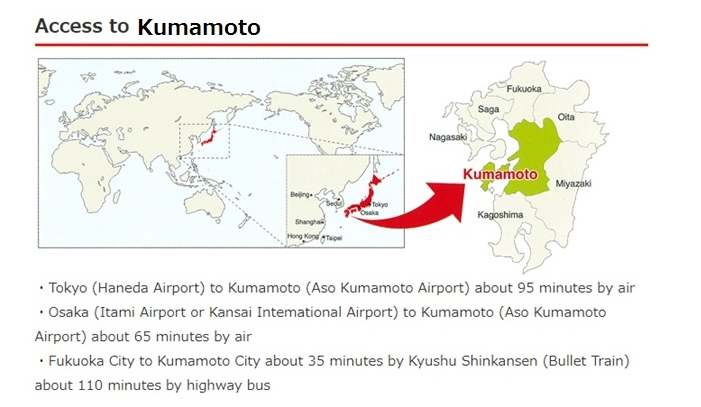 We can provide a pick up service from Kumamoto Airport to Nagomi House. For our internship program, you will simply need a tourist VISA as you will be staying 90 days in Korea and 90 days in Japan. 1. Complete the form below (bottom of page). 2. Send your Curriculum Vitae and a cover letter by email at acopia.cafe@gmail.com. 3. We will contact you to schedule an interview with you. 4. After the interview, we will contact you to let you know if you are accepted for the internship. 5. Book your plane ticket (keep us informed about the date and time of arrival / departure), whether you arrive at Seoul Incheon 1 or Seoul Incheon 2. A pick up service will be offered. 6. Pay the full rent before your departure by Paypal or Bank Transfer. 7. Get an insurance for traveling abroad. *PLEASE SCROLL DOWN TO THE BOTTOM OF THE PAGE TO APPLY.